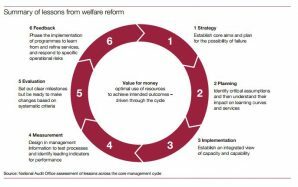 Welfare reform: The lessons that the DWP must learn from. The National Audit Office has requested that the Department of Work and Pensions (DWP) will need to use the hard lessons that it has learned from the recent implementation of welfare reforms to focus on improving how it manages change and anticipates risk. The NAO has released a report recognising that the DWP has implemented an unprecedented amount of welfare reform and an unprecedented number of major programmes whilst simultaneously dealing with cuts to funding and a surge in demand on Job Centres. These reforms are associated with (but not limited to) jobseekers, pensioners, disabled people and separated parents, with varying levels of success. It highlighted that there has been some high level failings and that the DWP have relied too heavily on uncertain and insufficiently-challenged assumptions. This led to a lack of understanding of its portfolio of programmes and overall capacity. It also stated the DWP thought too late about management plans and focused too much on reacting to problems rather than anticipating them. However, it did also acknowledge the context of these challenges and that progress has been made with major programmes. The report made a number of recommendations for how the DWP can deal with the future challenges that it will face. The recommendations included planning more openly for the possibility of failure, designing management information from the start, and building an integrated view of portfolio risks and capacity.